Capping off their month-long food drive, Lockaway Storage team members from across San Antonio rallied together at the Culebra Road location for the second annual Stuff The UNIT Event on June 2nd. After a successful month of raising money and food donations for the San Antonio Food Bank, the final push was about more than winning a prize for the most donations raised. The competition between the districts lead to the biggest donation to date from Lockaway Storage, nearly doubling last year’s donation and providing more than 50,000 meals for San Antonio’s residents who are most in need of food. Saying it was a hot day at Lockaway Storage on Culebra Road during the Stuff the Unit event would be an understatement. It was scorching! The high temperature according to the local weather report was 103 degrees. Thank you to our self storage professionals who made it to the event and were able to smile cheerfully, hold signs by the road, and make this event great despite the blazing elements! While the weather may have encouraged some folks to stay in the air conditioning of their home or work, there were plenty of others in the community that were prepared to make donations. 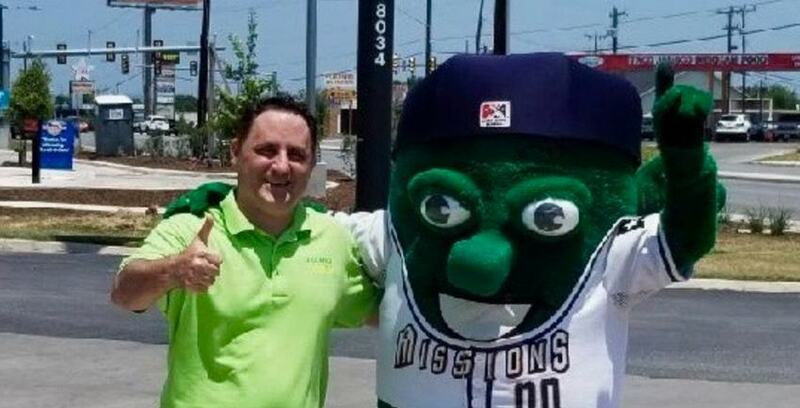 One particular guest that made an appearance was none other than The San Antonio Missions’ mascot, Ballapeno the jalapeno! Ballapeno bee-bopped around the facility where he greeted fans and even played a few games of corn hole. All of the team members who attended truly played a critical role in the success of the event. Macie Duncan, new mother and assistant manager at Lockaway Storage at 8223 W Loop 1604 N, arrived early with her sweet baby strapped securely to her torso. While Macie knew that she wouldn’t be able to help out like she had the previous year, she made sure she was able to contribute in a different way. Other parents brought their children to participate in the event as well. Macie said Amy Medrano, San Antonio District Manager at Lockaway Storage, was accompanied by her two daughters as they went door to door for donations. As the day wore on, donations continued to come in and so did customers and surrounding community members looking for the source of the savory smells of hamburgers and hotdogs coming from the grill. Danny Rios, who is part of the Lockaway Storage janitorial team, was a real team player that day as tended to the meat on the grill while standing on the seemingly even hotter pavement. Danny helped keep the team well fed as they held signs while dancing by the roadside and even on top of a container unit to help promote the event. Everyone played hard and gave it their all, so by the end of the day it was no surprise that everyone was pretty wiped. Despite this, the team dug deep and loaded a truck with all of the donations they had collected and drove it to the San Antonio Food bank. After doing the customary “weigh-in” at the Food Bank to determine how many meals these numbers translated to, it turns out that the Lockaway Storage San Antonio districts were able to donate 51,204 meals in total! Everyone was ecstatic to learn that they had almost doubled their meal total from the previous year! However, they also wanted to know which team ended up collecting the most donations. The biggest contributor and winner of the most donations went to Chris Laswell and Mauricio Contreras of Lockaway Storage on Culebra road. So how did they do it? Part of the Culebra team’s success came down to encouraging cash donations first, then filling their barrels with food items. Ashley confirmed that Culebra had won the company competition, and talked about the other teams that came very close winning too. With a little friendly competition in place you never know what might happen. In this case though, it is plain to see that the true winner of all of this was the San Antonio community. With such a need for assistance here, Ashley admits that she has a hard time not crying when talking about the San Antonio Food Bank because of her experience working with them and learning about the good they do in San Antonio. Ashley’s passion for this cause is deeply shared by her peers. In a team meeting about the food drive, Ashley said some team members opened up about their own experience growing up in times of hardship with little to no food. With strong motivations for wanting to help and give back to the San Antonio community, it’s no surprise that the overall San Antonio Food Drive and the Stuff the UNIT Event were so successful. Ashley is confident that the company will participate again next year, and for good reason.